An alternative to the standard caster load modules is the air lifting jack which contains its own base module as well as a lifting and leveling crank assembly. The air lifting jack works in exactly the same way as a standard round steel module except that it has the lifting and leveling facility. Lifting jacks normally have A-type air bearings on board and provide a degree of leveling which is critical for certain loads – usually machinery – that need to be level before operational use. Leveling is by way of a crank handle. 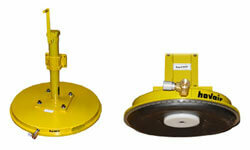 Air lifting jacks are supplied with mounting brackets for easy attachment to your load. To the right is a typical lifting jack which shows the air bearing and leveling assembly.